It's not quite what you think. Tanking (floating down a river in a tank) is lots of fun, but I prefer to do my tanking on a hot summer day. However, there are people who like to do it in the winter. If you're one of those, I invite you to join the 2nd annual Polar Bear Tank Race, March 6th and 7th, 2009 down the Middle Loup River in Mullen Nebraska. If you are looking for some winter fun that's out of the ordinary, join us on the 2nd Annual Polar Bear Tank Race. 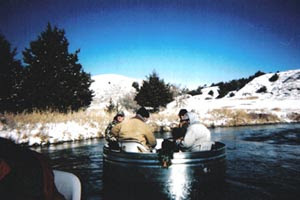 The 2nd Annual Polar Bear Tank RAce is being held to create awareness of the Sandhills Journey scenic Byway, and to allow people to participate in the unique experience of Tanking on the Middle Loup River in the winter... and as a fundraiser for the Sandhills Journey Scenic Byway. Join us for the most unique new winter event anywhere. Register now to insure your teams participation. Registration will be on a first-come, first serve basis. Doesn't that sound like fun? It looks to me like teams can be from about 4 to 6 people, with a registration fee of $150 per person that includes the tank and safety equipment, two nights lodging, welcome reception and chili cook-off, breakfast, lunch and a prime rib dinner at the awards banquet. Thanks for stopping by. The coffee is always on to warm you after you've frozen going down the river. Id LOVE to go taking in winter! it sounds tremendous fun! I might need that Coffee afterwards!